Today was the start of three solid and lengthy hiking days. Alvaro was joined by a second guide for the next three days Lynn who is currently a trainee. A two hour drive awaited to get to Torres del Paine National Park, along the way we stopped for a few photos including a nest of condors flexing their wings after a big feed. At the entry of the National Park we were informed that due to snow we would be unable to hike to the last viewing point of the towers which was over 1,000 metres. The weather however turned out to be great, in fact so good I was way overdressed and sent a good proportion of the day sweating, four layers of clothing (five if my two layered counts as two) was way too much. The hike was approximately 7.5 hours and a 27 kms round trip. Due to the strong weather Alvaro check with the park rangers and we were allow to go to the summit viewing area. Now this was extremely hard work, first due to the rapid incline and later due to the snow turning into ice as some points. Slipping was a very real problem, the hiking poles which I rented at the last minute helped somewhat. Eventually I got to the viewing area, a bit behind the others. The trip notes stated this as a physical fitness of 4 (out of 5), meaning 8 hour plus difficult hikes. This was right in the money and I should have prepared enter but I did make it and Alvaro had stated this was the hardest day. The granite towers were amazing. We got lucky with the weather, both in being allowed to go so high and that the weather cleared enough to get a view of these great natural displays. Maybe it was the exhaustion of the hike but they seemed worth the trip to me. My roommate Ben had what I would later refer to has his ninja gear on, irrepressible Ben is for sure. After completing the hike we then moved onto our private campsite for the night. Offered the choice we all went for a shower before dinner despite our hunger. The dinner was very enjoy starting with the Pisco sours to warm us up and the welcomed fireplace. All of us sitting around the triangle table also made for a more social dinner. I got the opportunity to talk to Nina about her experience working in the Arctic for three years, sounds like a great experience working on a frontier. Might be a future destination. 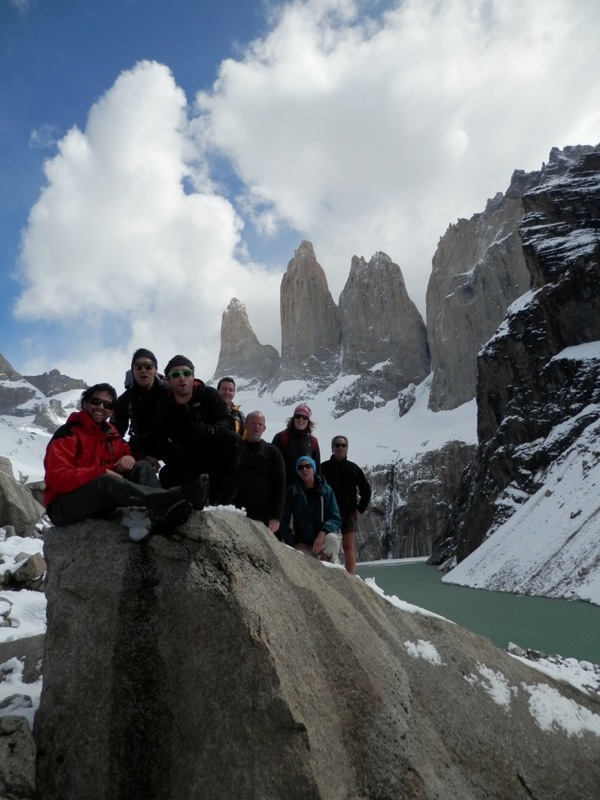 This entry was posted in World Trip 2012 and tagged Chile, Patagonia. Bookmark the permalink.